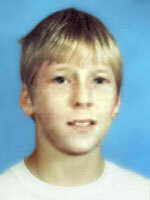 Delayed Justice » » Steven Earl Kraft, Jr.
Steven Kraft, 12, disappeared from his home in Benton Township, MI, on Thursday, February 15, 2001. He was last seen playing with his two dogs about a half block from his home at 7:45 that evening. The two dogs were eventually found, but Steven has not been seen since that night. Posted on Monday, January 26th, 2009 at 7:10 pm. Last updated on Wednesday, March 9th, 2011 at 4:25 pm.